While many Major League Soccer squads are starting their pres-seasons today, another player of note is looking to land a starting spot of his own. 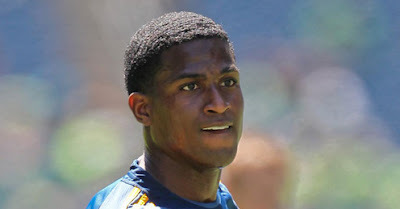 Edson Buddle is beginning a week long trial at Everton FC. Buddle left MLS in 2010 after a dream season in which he turned many heads for his goal scoring exploits, the same exploits that earned him a trip to the World Cup. After leaving MLS in 2011 for the German second division side FC Ingolstadt, where he played well, a recent coaching change leaves him out of favor. Enter Everton, who are currently desperate for cheap attacking talent and who already boast two Americans at the moment. Landon Donovan is enjoying a solid spell on loan for the Toffees and you'd better believe he played a role in securing Buddle the trial. It was Donovan who Buddle linked so well with for the 2010 LA Galaxy and if Buddle can find form, he'd likely return to a more prominent role with the national team. The national team is also desperate for a goal scorer, meaning that if this works out, it could be a three way win... Buddle, Everton and the USMNT. This would definitely be a huge step-up from Ingolstadt (especially with them facing the drop). Everton trying hard to eclipse Fulham as "America's Team." Rog Bennett at Men in Blazers would be proud.